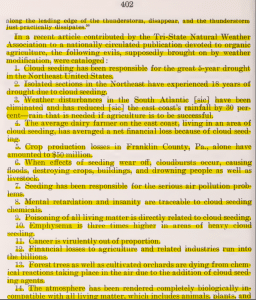 Although the document clearly states that the Federal Government has been involved in activities that involve weather modification, the general public is still largely unaware that this is even going on. Many still adamantly oppose the idea that this is even possible. 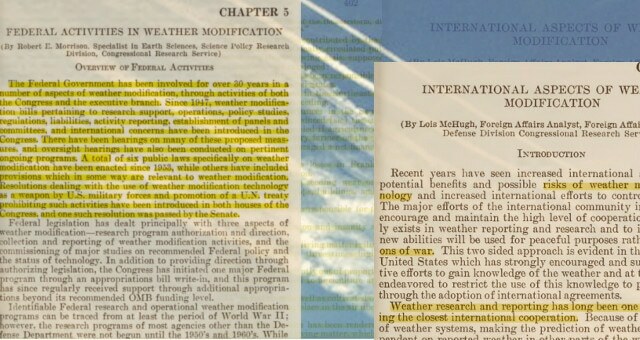 If Congress has known about this since at least 1978, why is the public still so clueless about weather modification? Geoengineering is also often referred to as ‘chemtrails‘ and also ‘cloud seeding,’ because geoengineering is most commonly done by seeding the sky with particulate matter. Many independent investigators and whistle-blowers concur that the government is dumping large amounts of aluminum, strontium, barium and even coal ash in the sky in an attempt to manipulate the weather. This has been verified by numerous USDA studies and is discussed in detail in the film, Why In the World Are They Spraying. “According to complaints we get, the pattern is still remaining as it did in the early 1960’s. When a thunderstorm appears to the west or is starting to build up, a plane will move in mysteriously out of nowhere, and maybe fly once or twice along the leading edge of the thunderstorm, disappear, and the thunderstorm just practically dissipates. 1. Cloud seeding has been responsible for the great 5-year drought in the Northeast United States. 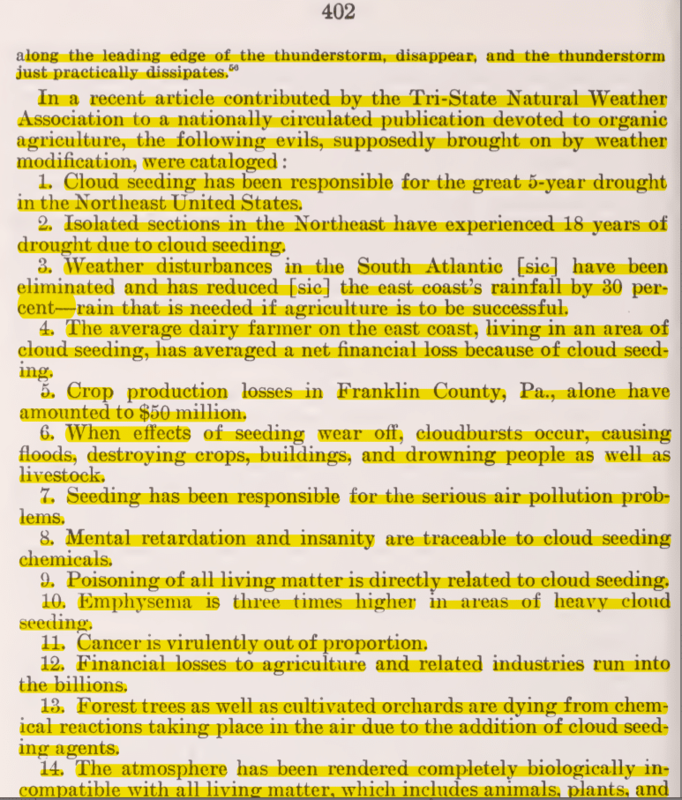 This document is only one in a list of many pieces of evidence that reveal the extent of geoengineering. Another resource is the extensive list of patents relating to geoengineering. It seems that nobody working in the government has any intent to tell us the truth about geoengineering, weather modification or chemtrails, so until the time comes when the government comes clean we’ll have to rely on the work of independent investigators to uncover the truth. Phillip Schneider is a contributing author to Waking Times. TLB recommends you visit Waking Times for more great/pertinent articles and information.